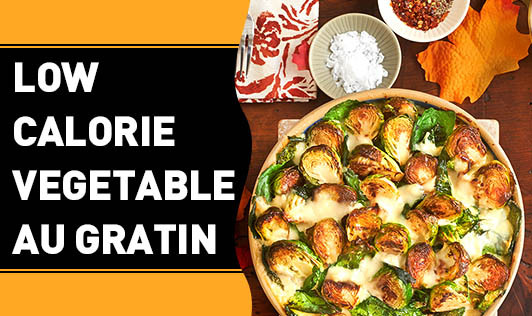 Vegetable Au Gratin is a creamy French delicacy traditionally served with a portion of buttered rice. A small portion of this healthy main course will help you make your boring weight-loss diet interesting minus the calories. But don’t worry! You don’t need to go for the rich version. This low-calorie recipe makes use of cauliflower puree, low-fat butter, and whole wheat flour instead of high-fat butter and refined flour (maida). Heat 2 cups of water in a deep nonstick pan, add the cauliflower, and cook on a medium flame until soft. Cool the cauliflower and blend it to make a smooth puree. Now heat a broad nonstick pan, add butter, whole wheat flour, and cook on medium flame for a minute, add milk, and cook while stirring continuously until no lumps remain. Add the cauliflower puree, mix well, and cook on medium flame for a minute while stirring continuously. Season with salt and pepper, bring it to boil while stirring continuously and keep aside. Heat a tablespoon of butter in a nonstick pan. Add the onions and sauté on medium flame for a minute until the onions turn soft. Add the green chilies and sauté for about 30 seconds. Add the chopped vegetables, mix well, and cook on medium flame for a minute or two. Add salt and pepper to taste and cook for a minute. Transfer the mixture onto a greased baking dish. Pour the sauce and sprinkle some cheese. Now bake it in a preheated oven at 200°C for 10 minutes or until the cheese melts. Serve hot with whole-wheat garlic bread.